There couldn't be a more perfect time to stage Assassins. With a book by John Weidman, which explores the reasons and motivations behind some of the most iconic presidential assassinations in American history, and masterful music and lyrics by Stephen Sondheim, Assassins combines a cleverly told and socially relevant story with witty and whip smart musical theatre tunes, and the result is a poignant masterpiece which reveals the terrifyingly comprehensible reasons behind the dark deeds of some of America's most infamous historical killers. 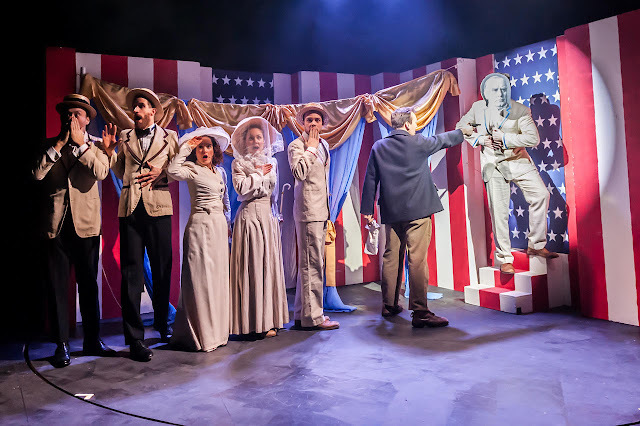 Fledgling theatre company Sevans Productions have revived this much-loved yet lesser performed musical, complete with a short and silent prologue which draws the audience's attention to none other than president Donald Trump. As if anyone could forget him. Moving on from the obligatory MAGA-ism, the bulk of the musical takes place in some sort of assassin purgatory, where historical nasties harp on their convictions. 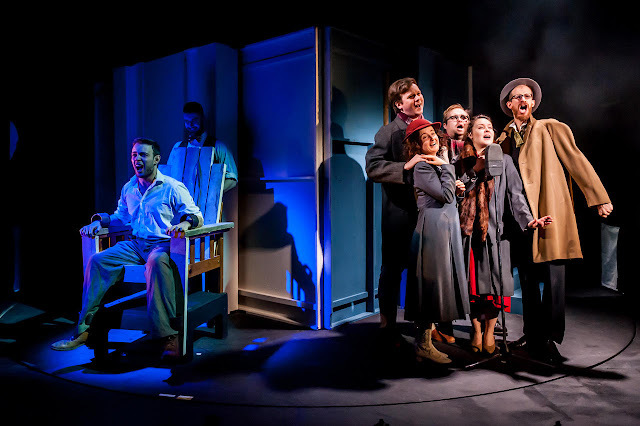 Rather clever set design by director Louise Bakker sees the stage rotate on a large revolve, allowing for plenty of inventive set changes to take place. One particularly striking bit of design sees the assassins slumped in chairs in a glorified waiting room decked out in stars and stripes. It's fascinating to see how the characters interact with each other, separated by generations but brought together by deeds. As the bebowtied master of ceremonies, also known as the Proprietor, Peter Watts leads an outstanding ensemble of performers who do a uniformly excellent job of humanising the ominous assassins. Highlights of the cast are Abigail Williams’ ditzy Sarah Jane Moore, Andrew Pepper's ostentatious Charles Guiteau, and Jason Kajdi as the Balladeer. The latter begins the musical in what looks like modern dress, overseeing the events and seemingly acting as a mouthpiece for the audience, but as he observes the motivations behind the assassins' actions he is absorbed into their world both literally and metaphorically. When Kajdi shows up again later in the piece, in a starkly lit room, and is introduced as none other than Lee Harvey Oswald, a man teetering on the edge of suicide before being goaded in to shooting JFK, it’s up to the audience to decide the significance of the multiroling which came beforehand. The overarching message of this production is easy to decipher; all it takes for a disgruntled citizen to change the course of history is just a single bullet. And a reason. At a time when gun laws are yet again making headlines in America, and on this side of the pond we are divided vehemently over Brexit, Assassins plays out like a cautionary tale. One particularly harrowing moment sees the assassins offer their guns to audience members, an action which highlights how each assassin started out as just an ordinary citizen, disgruntled by or disillusioned with their country and its leader. The musical may have been written in 1993, but in today’s unstable political climate climate Assassins feels as relevant as ever.